A High–Quality, Long–Haul, Fiber-Optic Transport Solution for RGB–HV & DVI–D. 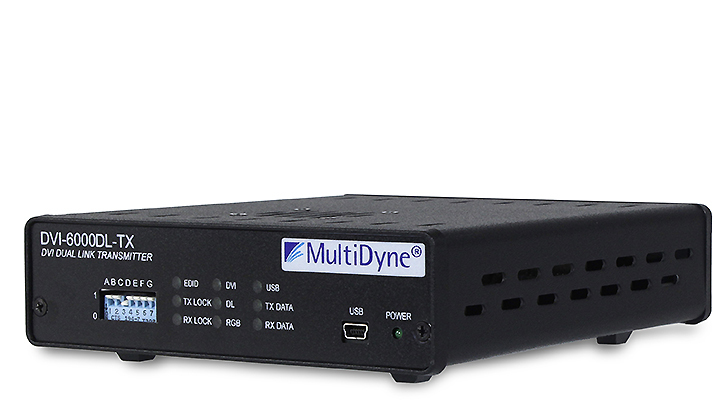 The MultiDyne DVI–6000 Single & Dual Link product is a long–haul fiber optic transport solution for high–quality RGB–HV and DVI–D with a DVI–I interface. Ideal for keeping video and audio communications secure in Command and Control facilities, the DVI–6000 Single Link supports up to 1920x1200 and the Dual Link up to 2560x1600 resolution over a single fiber, and has optional stereo audio and bi–directional data for monitor control. The DVI–6000 transports a pixel–for–pixel image that is 100% transparent with no frame dropping up to WUXGA, 1920x1200, and enables 100% 24–bits for all scan rates with no contouring or bit reduction at a high scan rate. The DVI–6000–FTX/FRX Digital Video Fiber Optic Transport System for digital video is a single–fiber solution. It has been designed to increase the transmission distance limitations of high resolution RGB and DVI video and computer graphics. The system will transport virtually any VESA–compliant DVI or RGB signal from 640x480 VGA up to and including 1920 x1200 @ 60Hz Reduced Blanking WUXGA or, with the dual link option, 2560 x 1600 WQXGA, as well as HDTV formats from 480P up to and including 1080P with full clarity over a single fiber. A loop through port on the FTX allows connecting a local display monitor. The DVI–6000–FTX/FRX also supports HDTV and non–RGB video formats such as YUV, YCrCb or YPrPb. The DVI–6000 has built in reclocking of the DVI signal to eliminate jitter. EDID data can be obtained from a local monitor connected to the loop thru port, a built in PROM, or, optionally, from a monitor connected to the FRX. 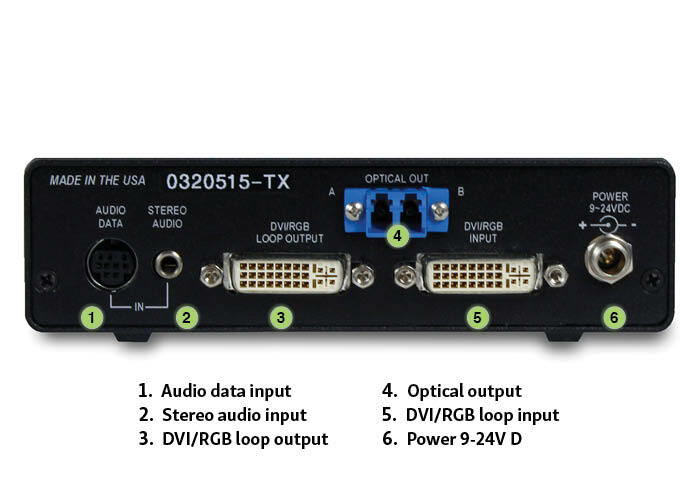 The DVI–6000–FTX/FRX also supports the optional transport of 2 audio channels (one stereo pair) and optional unidirectional or bidirectional RS232 or RS4xx type data (BDD option). The DVI–6000–FTX/FRX audio path is intended not only for line–level audio such as might be obtained from a computer sound card, but for professional 600 ohm balanced audio applications as well. No additional fibers are required for the audio or data options, although 2 fibers are required for bi–directional data and remote EDID options. The DVI–6000 supports operation and setup by the front panel switches (hardware mode). Most functions are automatic and should not require front panle switch setup. Future firmware updates will provide control and setup of features via a GUI (GUI mode). The optional GUI will interface to a host PC using the front panel USB port of the DVI–6000. Firmware updates may also be applied via the USB port. The DVI–6000 also has a SMPTE 348M option, whereby the data stream between the FTX and FRX is a 2.97GBPS SMPTE 348M SDTI–compliant stream (3G mode). In this mode the DVI video signal is packetized into a proprietary format and then transported via a 3G SMPTE envelope or physical layer signal. Instead of fiber transport, there is an optional 75 ohm coax cable transport feature for 3G mode. (Some features not available in cable transport mode). Applications include commodity and stock exchanges, medical and MRI displays, advertising, digital signage, air traffic control and military tactical displays, scoreboards and much more.